Den striit ende dat leven vanden vromen campioenen (naervolghers vanden alder vroomste[n] capiteyn onsen Heere Jesus Christus gebenedijt) der glorieuser mannen die twaelf apostelen. Antwerp, Hendrik Wouters (colophon: printed by Matthias van Roye for Hendrik Wouters, 5 March 1574). 8vo. With the title in a border built up from arabesque typographic ornaments and woodcut publisher's device on the otherwise blank final leaf. Set in textura gothic type, with incidental roman and extensive italic. With the bifolium K4.5 replaced by a very precise near contemporary (ca. 1600?) manuscript copy. 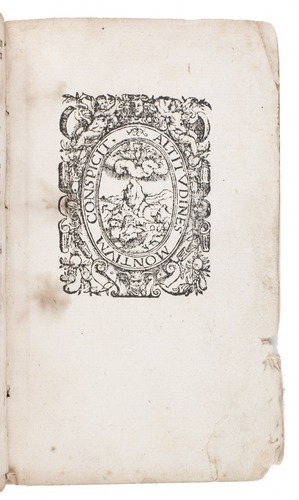 Contemporary limp vellum with a wrap-around flap on the back cover. 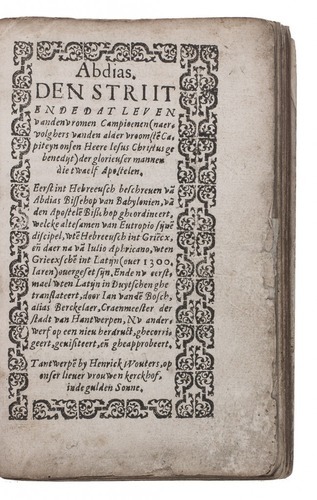 Most complete copy known (the only other lacking 4 leaves) of the last edition of the very rare Dutch translation by Jan vanden Bosch, alias Berckelaer, of lives of the twelve Apostles, supposedly written in Hebrew in the first century AD by Abdias, the first bishop of Babylon and an associate of the Apostles Simon and Jude. Pope Paul IV declared it apocryphal in the 1550s, and modern scholars support this, suggesting that the work was compiled from various sources (some now surviving and some not) in the late sixth century. 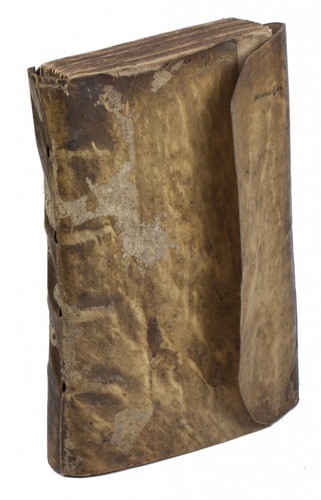 The text is now important both for preserving information from some early sources that have not survived and for its influence on later Christians. It is also important as an extremely rare edition by the Antwerp printer Matthias van Roye and publisher Hendrik Wouters. 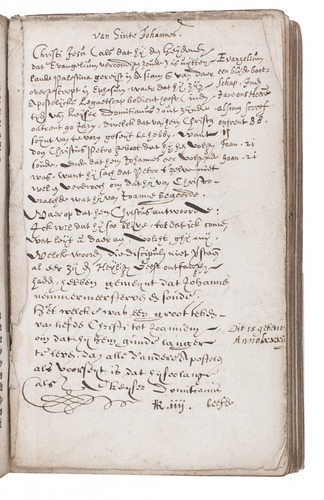 The fact that Jan vanden Bosch translated the Latin into Dutch and published it about ten years after the Pope declared the text apocryphal shows that its popularity and influence could not easily be countered. Peeter van Keerberghen first printed and published the Dutch translation at Antwerp in 1567. We have located only 8 copies counting all editions together, including the incomplete ones. The present Dutch translation first appeared at the height of the religious turmoil that was sweeping through the Low Countries, culminating in the iconoclasm of the years 1566-1568. Lacking one bifolium, but it must have been lost soon after the book was published, for it was replaced at an early date by a manuscript copy, also on an octavo bifolium. Though these two leaves show no watermark, the handwriting appears to date from ca. 1600. The title-page is somewhat worn, with tattered edges (reinforced at one spot with a piece of tape) but not affecting the type, and the manuscript bifolium has come loose and is somewhat tattered at the edges. The book is otherwise in good condition, most leaves very good, and only slightly trimmed. The sewing supports have broken where they were laced through the vellum cover, so that the cover has come loose from the bookblock, the front endleaf is torn and chipped, and the vellum cover is somewhat wrinkled and dirty. 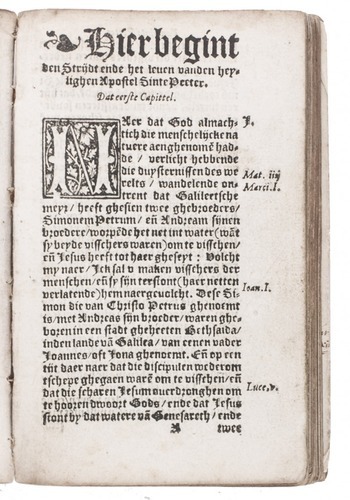 The most complete of the only two copies known of the last (1574) edition of the only Dutch translation of a 6th-century collection of biographies of the twelve Apostles. KVK & Worldcat (1 copy, lacking 4 ll. ); cf. Belg. Typogr. 5, 6, 7740; Machiels 5-8;USTC 407639, 409815, 409817.